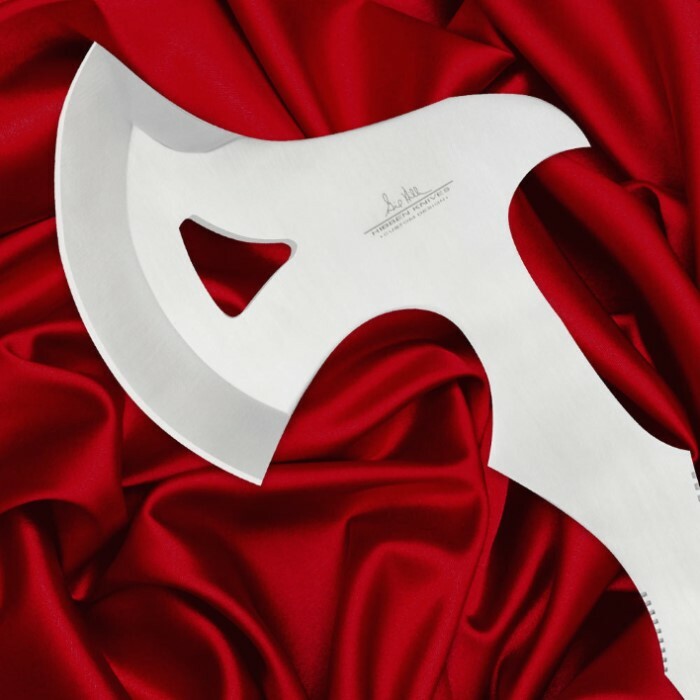 Designed by the man himself, this professional-grade throwing axe features one-piece, full-tang stainless steel construction with an attractive satin finish. The curved blade is sharp to help make sure you penetrate your target effectively. The unique shape of the handle provides a secure grip for improved accuracy, and the cut-out designs in the construction provide a well-balanced weight. It comes with a reinforced blade sheath for convenient and safe transport and storage. 11.75" overall length. I bought two of these throwers and enjoyed them A LOT. they were really well balanced and had a nice thickness and weight to them. It was sad when (like everyone else's) they broke on the finger grips. If these were worth $10-$15 then they would be better but... they were rather disappointing. Bought 4 and lost 2 to breakage in the first thousand throws. The Internet competition costs half as much and has half the breakage rate. Pity, the handle reminds me of the forward swept handle if the francisca and led to tight hard hitting rotations of the blade. Good ratio of firepower to compactness. Anyway, did I mention that they break a lot? Too much to be worth the money. I had my axe almost a year and I haven't seen it break around the thumb or finger grooves yet. I think it is still a great thrower. Like the others, it seemed to throw well until it broke where the thumb and finger grooves are. Grooves really are not needed so it would be nice if the axe could be strengthened there. Otherwise it seemed to throw well. But it broke way too soon - so I only rated it fair. This is a lovely thrower, however if you hit it to hard on the flat side, there is a very good chance it will break. I read the reviews about the axe breaking at the finger grips, but I ordered it anyway. Turns out these guys were right. I recently purchased 3 of the Hibben throwing axes. They are great throwers but all three have broken in the same spot where the thumb and finger grooves are. I welded all three and continue to throw them. I could live without the thumb/finger grooves if it would cut down on breakage. Well balanced feels good in your hand. These throw very well however they have one flaw that I have found. I have bought two of these and have had one replaced already. The problem is the nice thumb and finger grip is exactly where all three has snapped, if this problem gets fixed it will be a very nice piece. I've never thrown an axe before, but with in 2 hours I was hitting my target. It didn't take me long to get use to throwing an axe. 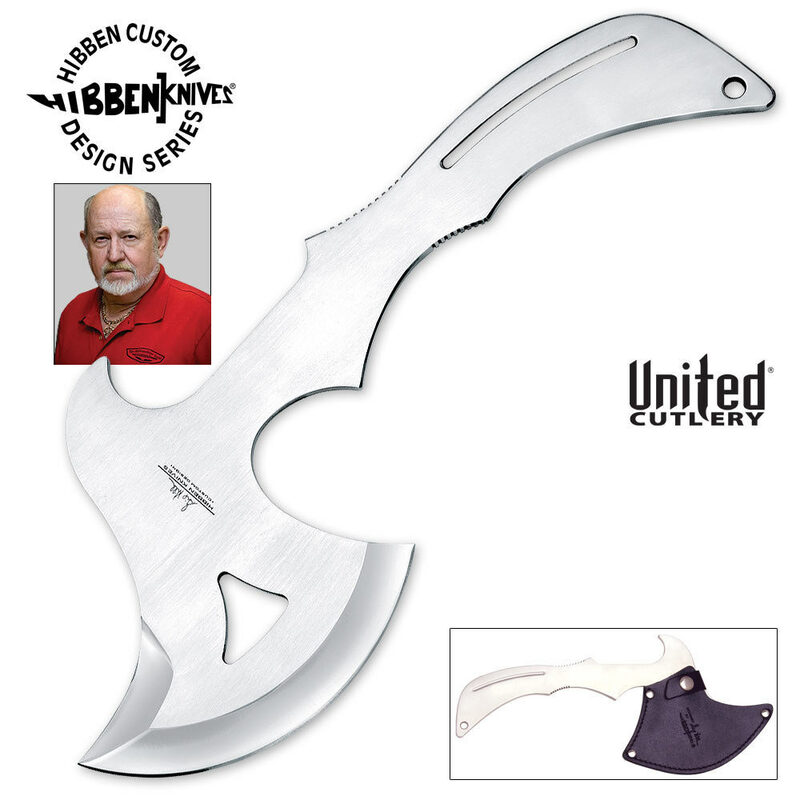 Gil Hibben has done a good job with the design of this great thrower. I am thinking seriously about buying another one. I am a new thrower. I have placed three orders for Hibben Throwing knives. Very happy with the knives, feel, design, balance weight to length etc. I have just placed an order for three Hibben throwing axes. I will place my findings on the throwing of the axe here after giving them a few throws. I expect that they will be exactly what I am looking for. I have reviewed several other knives, Hibben's is by far more superior in feel, balance and throwing. I don't need to search any further. Thanks Gil, for making my old age a little more fun. Sully age 67.